Step 1: Don’t actually sell peanut butter. Step 2: Create a fashion collection around the peanut butter you don’t actually sell. Step 3: Start selling peanut butter because people love your fashion so much that they want to buy the peanut butter you’re „advertising“ on your clothes. 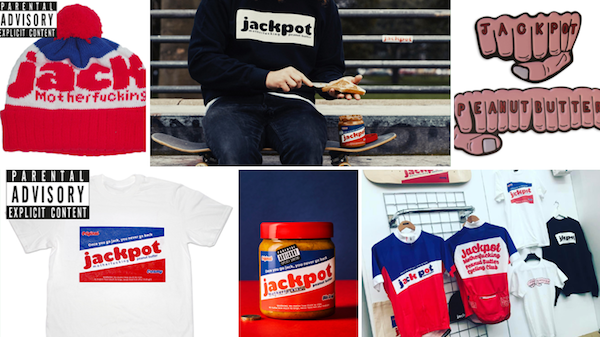 As a result of what started as a simple fashion collection the streetwear label A Public Nuisance (APN) ended up extending their product range to actual peanut butter, accessories and skateboards. With this move APN not only shows the impact brands can have on pop culture. The brand hit a nerve with their retro-style logo and simple design in combination with their raw language, as it complies perfectly with the need of the young generation for „real“, unpretentious brands.